N.C. Court Blocks Attempt By State Lawmakers To Limit Incoming Governor's Power : The Two-Way Judges delayed a law signed by the outgoing governor of North Carolina, who was defeated in November's election, requiring his successor's nominees to be approved by the Republican-controlled Senate. 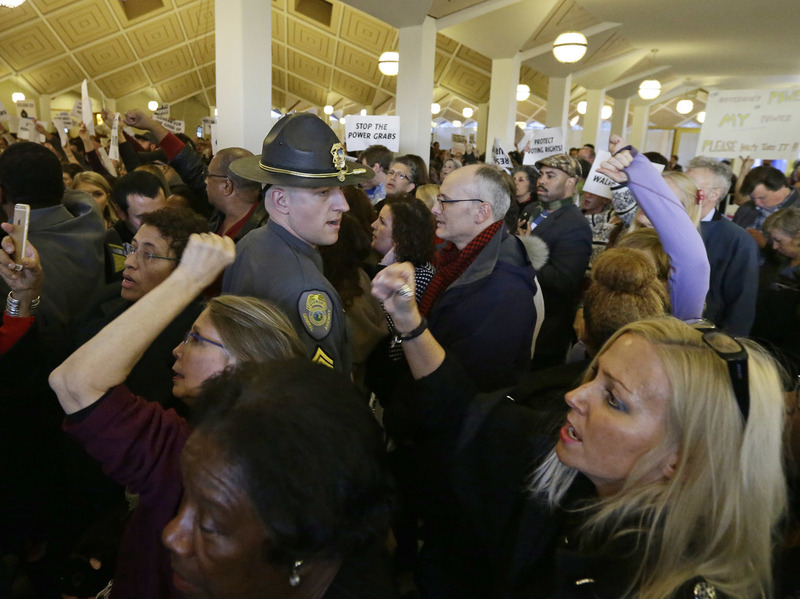 Demonstrators at the state Legislature building in Raleigh, N.C., on Dec. 15, 2016, during a special session to pass laws limiting the power of the state's new governor, Roy Cooper. A three-judge panel in North Carolina has issued a temporary restraining order blocking a law that strips the state's new governor of some powers. The law was signed by outgoing Republican Gov. Pat McCrory and requires state Senate approval for Cabinet nominees of the new Democratic administration, something that was not required for McCrory's own nominees. The Republican-controlled state Legislature passed the measure after McCrory lost November's election to Democrat Roy Cooper. Democrats called it a "power grab." Republicans still hold large majorities in both chambers of the Legislature. On Wednesday, the court issued a temporary restraining order until a hearing on Friday, effectively blocking Senate confirmation hearings until the end of the week. Republican leaders called the ruling a blatant overstep, adding that what they called the judges' decision to legislate from the bench will have profound consequences. In a statement, the governor said the court is absolutely correct and should not be intimidated by threats from legislative leaders. "Cooper attorneys argued that the confirmation process equated to essential veto powers of the governor's cabinet choices, while lawyers for [the Legislature argued] that the authority to provide advice and consent is specifically delegated in the state constitution and does not interfere with the governor's ability to nominate, supervise, or control his appointments." The hearing on Friday will decide whether the restraining order will remain in place until a full trial, which is currently scheduled for March 7. As The Two-Way has reported, the law under consideration is one of two laws limiting the governor's power passed after the election. The other, which was temporarily blocked by a different court in December and remains under consideration, removes the State Board of Elections from the governor's control by reducing the number of members on the board from five — three of whom could be from the governor's party — to four members, evenly split between the parties. The law also increases the power of the state's appellate court and requires the party affiliations of judicial candidates to be printed on ballots.